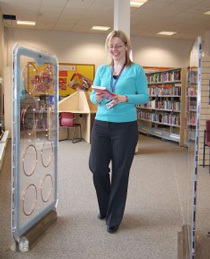 EM (Electromagnetic) Technology (also known as the 'tattle-tape' system) is an older library security system still found in a reducing number of school and public libraries. 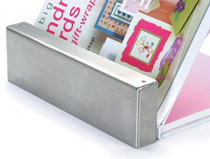 RFID is now becoming the industry standard for new library systems and D-Tech RFIQ™ provides the perfect upgrade path for schools. Checkpoint, Meto, Knogo, Sensermatic, Dialog, Certus, Gateway and many more. Our lower cost passive deactivation and reactivation model is also available and requires no power to operate. Library Plus supply a full range of EM labels, from integrated bar-code and security strips to spinal labels. All our labels are compatible with most if not all security systems. If you're looking to replace your EM security gates then please contact us and we'll gladly discuss our range of solutions to fit your budget and requirements. Our SelfCheck kiosks come with an integrated deactivation and reactivation device. This enables library users to check out items themselves without staff assistance.